Huck wrote: John VIII Palaiologos, since 1425 the "Eastern Emperor", which in 1439 appeared during the council in Florence, travelled in 1423–24 to Venice, Milan and Hungary (? also to Florence ?) to ask for aid against the Osmans in person. Apparently the Arabic text was copied from an inscription of gold on blue on a garment that was gifted to the Emperor (beloved of the Pope of Rome) by Mamluk SultanAshraf Sayf-al-din Barsbe (also known as Abu-El Nasr,)who reigned from 1422 to 1438. His feet and arms and neck laden with chains. Yonder are Pluto and Proserpina. That dealt him such a wound in Thessaly. Before the chariot goes Jupiter." Jupiter: the figure wearing an elaborate Byzantine robe and headdress (known since the days of the East-West Union Council in Florence in 1439) is obviously chief among the group and thus Jupiter. Mercury: the figure preceding Jupiter, wearing the hat of a merchant or artisan (germane to Mercury’s “children”) and cut in half by the edge of the left plate edge, would be Jupiter’s messenger/herald – Mercury. of the mantle about him. Mars: Mars is always shown armored with a helmet that is usually winged, such as in the illuminated Crivelli Sphaera, just as he is here. Venus: of the two women it’s not difficult to guess why one of them was granted the favor of riding upon Cupid’s chariot – his mother, Venus. Moon: Bespeaking to the bovine horns the lunar goddess sometimes wears, the woman who wears the two-horned hennin headdress is Luna. Saturn: this planet was associated with old age, such as in the Guariento series in the Eremitani in Padua, and sure enough we have an extremely full beard on the male at the top of the frame. But also note the curious, elaborate hat he wears, perhaps also Byzantine; I have looked everywhere for a match of the PMB’s “Hermit”/Saturn’s hat (see the upper right hand corner of this webpage’s screen for that ever-present detail) and have only found it here…in a grouping of the seven planetary gods. Baldini and the Bembo studio must have been referring to commonly-derived pattern books with similar planetary god images, presumably lost (few working source books have come down to us). 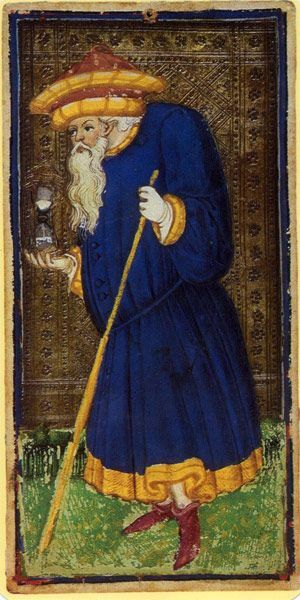 After the Union in Florence and the increased exposure to "Eastern" dress, Saturn is also shown as richly dressed, not just an an aged man, often naked, on a crutch, in keeping with notions of the wealthy East, Magi, etc. Thanks for resurrecting your old post in this new context, Phaeded. I am interested, primarily because Hermes Trismegistus as the PMB Old Man fits my hypothesis of an Egyptianizing intent for a few of the PMB cards, perhaps influenced by Ciriaco, in Cremona at the time of the cards. I hadn't connected the headgear with Hermes Trismegistus until reading your post. He of course was identified with Egypt, part of the original territory of the Byzantine Empire. In this regard I have a few questions about your analysis of the very relevant Baldini. Did you mean the figure with his hands tied behind his back? I have no idea who he is (it seems male), but Venus is unlikely. I would have thought Venus was the very richly attired lady next to her lover Mars. If not Venus, who is that lady? And who is the person with his hands tied behind his back? Aren't these the same person? If not, which two figures are you referring to? I would have thought that the man with the full beard and the elaborate hat was indeed Saturn. If so, I do not know who you mean by Jupiter. The only figure unaccounted for is the youth with his hands behind his back. He wears an odd headdress that I can't identify. But he seems an unlikely Jupiter, because of his plain attire. 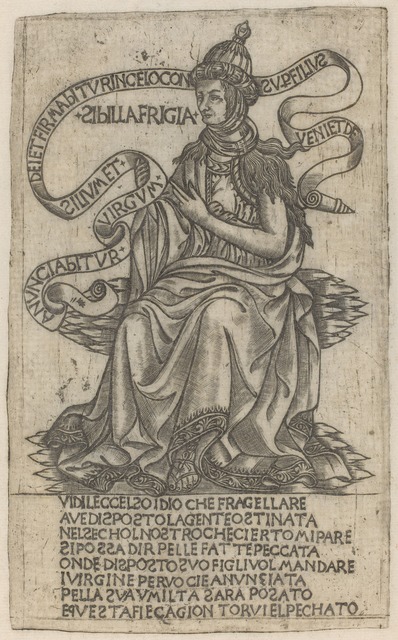 Baldini's headdresses on the prophet and sibyl seem to me to relate to the ChVI Pope card. The Hermes Trismegistus in Siena does so as well, even more. That doesn't Egyptianize the Pope, assuming that the pavement and the card are independent of each other. But it at least, for Baldini, associates papal headgear with that of famous prophets of the Eastern Mediterranean and, for the pavement artist, Hermes Trismegistus with papal headgear. Added later. 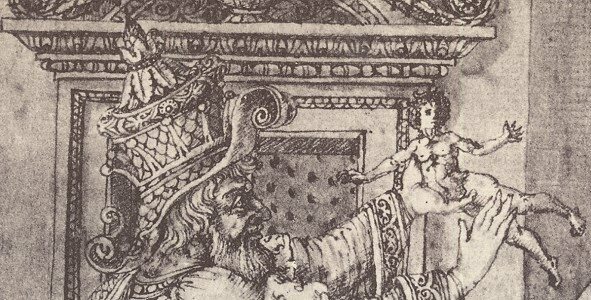 Here are the relevant details from a drawing by the artist of the Florentine Picture-Chronicle reputedly of Hermes Trismegistus, very much in Baldini's style. 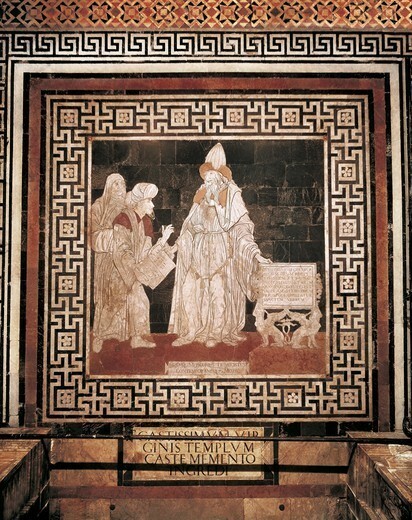 He is said to have made an engraving of it. Reproduction and description at http://www.britishmuseum.org/research/c ... 3&partId=1. In this case it is a three-level crown, like the popes' at that time. It seems to me that the PMB Old Man's hat also has three levels, but vaguely as they are not well defined. Nonetheless I'm now tending toward the seated figure as a generic captive (perhaps the gender was left ambiguous to underscore "everyman" as the allegorical significance) with Venus simply denoted by her son, cut off from this detail, but on his usual pedestal atop the float. The most elaborately dressed figure looking straight ahead with a long train of cloth trailing after him is who I identify as Jupiter, who should be the most extravagantly dressed in the minds of a Florentine. And the only other figure also looking straight ahead would be his herald walking ahead of him, Mercury (donning his "children's" garb of a generic guildsman or merchant), whose face is cut off to the left. 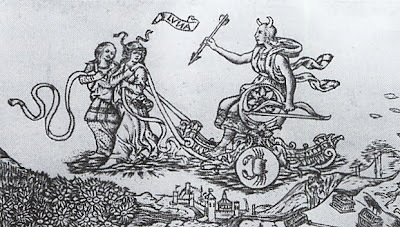 The figure immediately behind and to the left of Jupiter is Mars, wearing a chain mail skirt, breastplate and winged helmet (like one finds repeated on "Roma" on Roman coins). 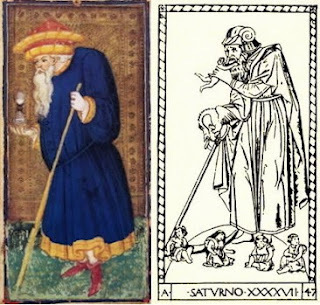 Saturn is the upper left figure with the virtually identical headgear as that of the PMB "Time"/Hermit trump, and similarly has a long shaggy "Byzantine" beard. The figure cupping his hand to his mouth to yell up at Eros is inspired by the textual source of Petrarch: "Apollo, who once scorned the youthful bow, That dealt him such a wound in Thessaly." 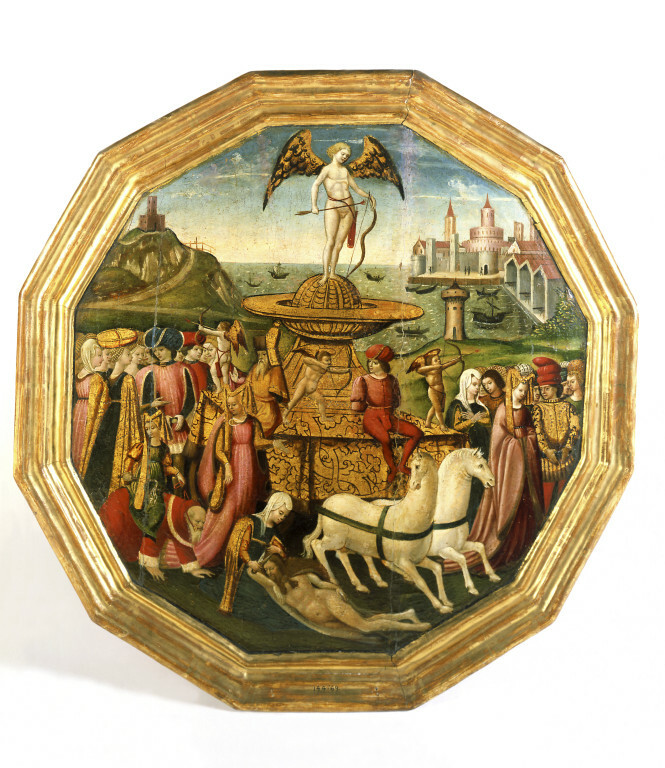 Here is the Baldini Triumph of Love detail again, but labeled with my identifications. Note that Eros' pedestal and the vertical spoke of the wheel neatly divide the engraving into two halves, the planetary gods on the left, perhaps with a representative of bound humanity (whom were of course subject to all of the planetary influences), while the human populace proper follows in their wake in the right half of the engraving (not shown). Baldini's concurrent interest in the "Children of the Planets" is undeniable and it is not unfathomable that he attempted to merge that fairly novel theme (likely imported from Germany after being first conceived of by Christine de Pizan) with the well-worn Triumph of Love, which already implicitly involves Venus and her son, with Petrarch himself naming some of the planetary gods in his Triumph of Love text (e.g., Jupiter, albeit not in a planetary context). Thanks for the claraification, Phaeded. It still seems to me that your "Jupiter" is a woman, surely Venus since she is next to Mars. In that case the bound captive may be Jupiter, since that is the only one of the seven left unaccounted for. He was well known as a captive of love. His lack of regal attire attests to his status as Love's captive. I hadn't noticed the beard. Thanks, Phaeded. And that page from the picture-chronicle is very nice.